Whoosh! Birthplace of the International Association of Xena Studies! Whoosh.org is what Whoosh is (I yam what I yam). It's been a fun and wild ride. I am happy it is still here. Here be essays, articles, commentaries, episode guides, historic airing schedules, convention reports, boutique websites, uber fiction, various analyses of genre television shows and cinema, and a plethora of other materials concerning strong women in popular culture, popular women in strong cuture, and other stuff that strikes me as cool, weird, interesting, or fun (in a pleasant or not so peasant way). Welcome, make yourself at home, and stay a while. I'll put the kettle on and please, jump in anywhere. Mi website es su casa. Join me as I walk down memory lane and review what the vibrant and massive internet fandom of XWP elected as the best and worst episodes of the entire show when they were still fresh in everyone's minds. Pull out the videos or DVD or tune into Oxygen and have yourself a fun time revisiting the best and worst, and when you are done partaking the visual and audio pleasures of XWP, check out the Whoosh.org articles and episode guide discussing the episode. Once you are solidly entrenched in the Xena-Zone, visit Laura Sue Dean's "News Gossip Rumors" and relive the absolute joy and nirvana it was to be a Xena-fan during the airing of what was one of the most exciting, exhilerating, internet-community-blossoming, mind-blowing, life-affirming experiences of the turn of the century. If you were there when it happened, oh the stories you can tell. If you weren't, lucky you - Whoosh.org is here as a monument and living record of how XWP transcended television, cheese-ball fantasy, and camp up the wazoo. ENJOY!!!! 06/29/2018. Added html of BatMorda's Resurrection of Xena fan fiction chapters 6-11. Enjoy. 06/28/2018. Other than adding some BatMorda stuff, I am still retired from webbing. And I still , of course, miss Wes. Don't worry I am not morbid or wasting away from it. I am very present and engaged with the world. I just think it's a bummer that Wes isn't around everyday like he used to be. 02/21/2009. I need to clean up this site for posterity - it's a mess, but I keep it up in the meanwhile for those who do want to have access to it. Yes, I am still in my website funk. I haven't decided what I want to do with the website. The site is still getting around 3000 visitors per day (over 90K a month, over a million a year) so some people find the site still useful. There's so much more potential for this site, but to be honest, when Wes died a part of my soul went with him and it was apparently the part that fueled my web mojo. 12/23/2007. I actually puttered around on the main page today. Perhaps another false start or maybe I am am indeed coming out of my website funk? Only history will tell. 07/15/2007. Beware the Ides of July. Hear that Julius? I have a MySpace Page -- feel free to visit: http://www.myspace.com/ktaborn. I will be at Comic Con in July, so give me a holler if you want. 01/05/2007. I will be at the Burbank Xena Con 01/12/07-01/14/07 and staying at the convention hotel (Marriot now I think, was a HIlton?). If you get bored or just want to say hi, either hunt me down or leave a message for me at the hotel. Trust me, I am available. 06/24/06. It's the weekend WOO-HOO! I updated and reorganized the Adult Swim home page. I will be adding episode info later [yeah right!]. I also updated the 24 home page and added some short plot synopses to the first season. 06/18/06. Puttered around the site this morning. Made an archive for this area (see "Whoosh News Archive" below) and cleaned up and added some news to the Episode Guide General News area. 06/17/06. Mourning is b****. The spirit is willing but it takes a lot of energy to get up in the morning and as much as I love this site it is more difficult than I ever imagined to get back into the website frame of mind. But, tonight I added the shell of an episode guide (Hex -- thanks Bat Morda; you have helped me in some very crucial ways through this funk I am in, I will never forget it), and it has made me realize I could be adding a lot more shells here and there and have the illusion of some progress made at the site. I am sitting on a lot of articles that as soon as I recover my editng mojo, I will slap on the site. I am trying to find a microphone and mixer and then the podcast will happen. Baby steps! 01/17/06. The process of action is slow, but if you are patient, you will see some! My two television obsessions right now are Battlestar Galactica and Veronica Mars. We have in the works expanded episodes guides and articles for there shows. I also have some plans for expanding the film area. So thank you for bearing with me. My goal is to continue adding to the site and to clean it up and make it easier to use. Yeah, lifetime project I know. I cannot believe that in eight months we will be 10 years old. That is ancient on the internet! And I am shocked by out traffic. We will be hitting 200,000 visitors per month soon and that is making me feel lots of guilt on not working on the site more. Maybe I will make my son work on it too. I have already brought Cynthia out of retirment by bribing her with Veronica Mars DVDs. Who knows who else I can corrupt and manipulate? Stay tuned! Click here to see some of Kym's contributions to the Season Three Xena DVD set. It was the closest I have ever gotten to being asked to go to the prom, dontchathink? And if that's not enough excitement, we've opened a store! For now, you can get select genre junk until the cows come home... and they will come home. We are ALWAYS looking for submissions so please send us what you got and you too can be part of the elite, highly special, and above average Team Whoosh! Click here to help support this site. We are not too proud to accept help, especially with half my income gone. It's all in the movies, baby. Read about the archeological find of the century! Godzilla is just **too cute**, dontchathink? Wonder how to copyright your website? Find out how here! More fun stuff -- check it out! If you gotta find it fast, click here! In memory of Wesley Taborn (1953-2005): son, brother, cousin, husband, father, friend, coworker, and best friend. Want to put a link to Whoosh! from your own site? Visit our Grab a Banner page. Visit our Shamelessly Self-Promotional Commercial Links page. Visit our In the News area where you can see where Whoosh! has been mentioned by other media. The views of the authors of the articles, reviews, reports, editorials, and other content published in Whoosh! represent the various and at times conflicting views of individuals active in media fandom and are not necessarily endorsed by Whoosh! or its staff purely by their inclusion into an issue. The articles are intended to foster debate, explicate theories of intrepretation, and to add to the viewers' understanding, appreciation, and enjoyment of Xena: Warrior Princess or popular culture in general. If you are affected, positively or negatively, by reading any article in Whoosh!, the editorial staff strongly encourages you to express your concerns to us through a letter to the editor or through private e-mail to the author of the article. All of our staff and contributors work very hard for free, so please do not steal, sell, or borrow (or however you might put it) their work without our knowledge. ALWAYS request permission to reprint material through Whoosh!. We are extremely reasonable. Don't learn the hard way. Please ask first. You can ask by writing to editor@whoosh.org. All Whoosh! material has been physically registered with the U.S. Copyright Office. All rights reserved. No part of Whoosh! may be reproduced or utilized in any form or by any means, electronic or mechanical, including photocopying, printing, recording, or by any information storage and retrieval system, without permission in writing from the publisher. Publication on the Internet does not imply relinquishment of any rights granted under copyright law. Special license is given to individuals to make copies of this material provided that it is for their own use, that they do not make a profit from the copyrighted materials, and that they do not distribute them publicly. All other uses expressly require written permission. Whoosh! in no way intends to infringe upon the rights of holders of copyrights held and/or referred to in this non-profit fan publication. Content of original stories and artwork are copyrighted to the authors. Whoosh! , IAXS, and Kym Masera Taborn holds the copyright on the Whoosh! edit, while the author holds the copyright on the content of the article. The author is free to re-edit and rewrite their content without permission of Whoosh!, but if they wish to use the Whoosh! edition, subsequent edits, and/or presentation, they must have the express permission of Whoosh. Whoosh! , IAXS, and Kym Masera Taborn holds an unlimited reprint license on all original content appearing in this publication including editing decisions and retains complete control and use over the presentation and final edited version of the article. Text versions of some Whoosh! back issues are available in zipped format at http://whoosh.org/archive. Please send submissions for the journal, the On the Road section, Uber uber Alles, the FAQ, etc. 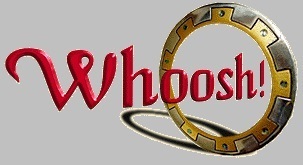 Whoosh first went on-line September 17, 1996. WHOOSH! observed the May 13, 2000 Blackout. This blackout was organized by various genre fan websites throughout the world for websites to stand in unity for freedom of expression and creativity. To read Henry Jenkins article on what really is at stake PLEASE CLICK HERE and to read Jesse Walker's article about how intellectual property laws stifle popular culture PLEASE CLICK OVER HERE.